This entry was posted in News on March 13, 2018 . Officials with the District of Guysborough aren’t happy with a bill introduced in the Legislature they say creates an uneven playing field. 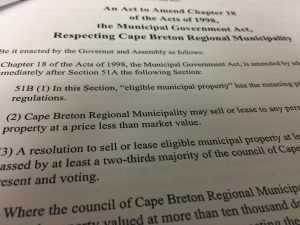 The bill, introduced last week, would allow the Cape Breton Regional Municipality to sell or lease property at a price less than the market value. Guysborough District Warden Vernon Pitts says his municipality has always purchased and sold land for development purposes at market value, so this proposed change is concerning. Pitts worries if this bill is passed, it could potentially pit one municipality against another. The municipality has written a letter to the province expressing its objections to the bill.